If there’s one thing’s for sure, Laura Silver is crazy about knishes. And there’s a good reason for that. On Sunday at the Jewish Museum of Maryland, Laura Silver told the story of her genealogical journey in which she traced her roots back to the Polish town of Knyszyn, where both her great aunt and her maternal grandmother where born. One could even say that Laura’s passion for and connection with the knish is a birthright. 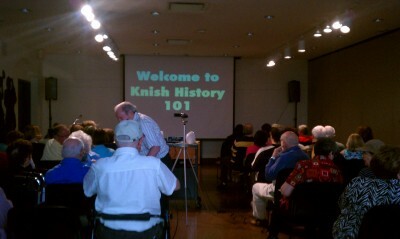 Welcome to Knish History 101: Audience members take their seats in anticipation for Laura Silver’s talk about the history of knishes. But what exactly is a knish? Knishes are essentially dumplings that can be round or square, and are filled with potato, ground meat, spinach, kasha, or really anything you can think of to stuff inside a pocket of dough. There is not one particular type of dough that defines a knish, but in general, the audience members shared an intuitive sense that knishes are made from a pastry or filo dough rather than noodle dough like its boiled Polish cousin, the pierogi. While there is some debate about what makes a knish a knish, when asked, Laura Silver poignantly answered that it is the spirit behind it that makes a knish a knish. 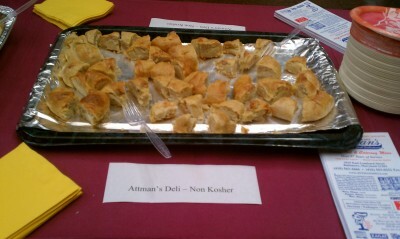 Some of the knishes we served at the program, courtesy of Attman’s Delicatessen. Joining Laura for the question and answer session was Anita Baum, original owner of The Knish Shop in Pikesville. Having grown up in a catering family, Ms. Baum also has a deep connection to the knish. She prefers meat to potato knishes, and bakes hers from leftover brisket. Ms. Baum always has knishes on hand – if there’s nothing else her granddaughter will eat, she can at least serve her a homemade knish! 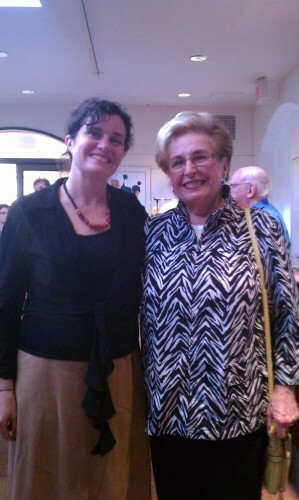 Knish expert Laura Silver with Anita Baum, former owner of The Knish Shop in Pikesville. 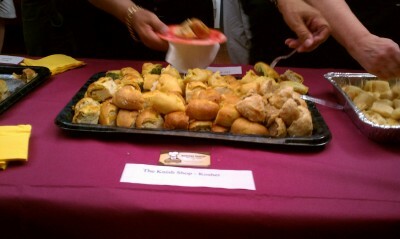 Thanks to The Knish Shop for providing knishes for visitors to sample. The knish discussion stirred up memories for me too. Laura Silver had a slide of the Kosher Stand at Memorial Stadium (the old baseball stadium in Baltimore), where they served potato and meat knishes. My family is originally from Long Island and even though I grew up in Delaware, my dad raised me to be a New York Mets fan. As a child, my dad often took me to baseball games at Shea Stadium. My distinguishing memory from these games involves eating square potato knishes with my dad, followed by a plastic baseball cap filled with Carvel with rainbow sprinkles for dessert. 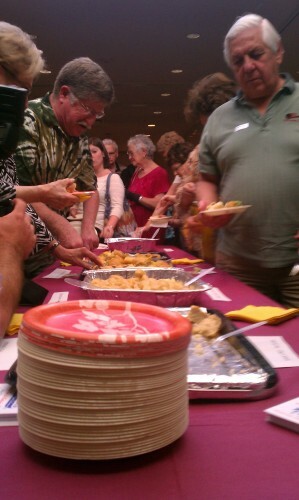 Visitors eagerly sample knishes after a lively discussion with Laura Silver. 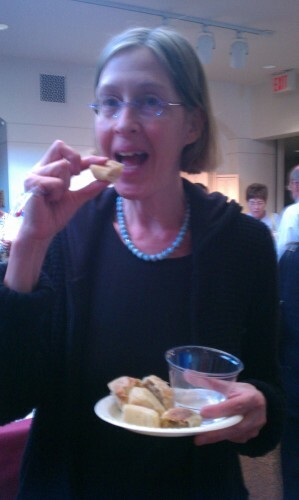 My mother in law tasting a knish. At the end of the program, it was clear that Laura Silver had achieved her goal of getting the audience to join in the knish conversation. We each had our own knish memories and stories to share, and had the opportunity to sample knishes from The Knish Shop, Sion’s Bakery, Hoffman & Co., Caterer of Distinction, and Attman’s Delicatessen. If this post has left you hungry and inspired to make your own knishes, I suggest this recipe for Potato Knishes from the The Shiksha in the Kitchen. Enjoy! This post beautifully captures this fun (and calorie) filled event. I can’t think of a better event for a Jewish museum than a celebration of the knish. The Chosen Food exhibit was wonderful too.